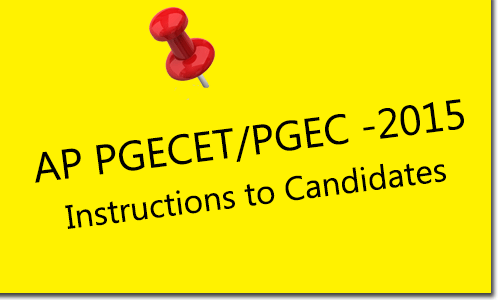 AP PGECET/ PGEC – 2015 Admissions 30 Instructions to Candidates : The GATE qualified and eligible candidates of 2014 and 2015, GPAT and AP PGECET qualified and eligible candidates of 2015 are informed to attend AP PGEC/AP PGECET web counselling for admission into ME/M.Tech/M.Pharmacy courses for the academic year 2015- 16 as per the schedule given at any one of the Help Line Centres. 1. Candidates are required to be present on the notified date and time at the helpline center with all the relevant certificates and fee. 2. Candidates are called for registration rank-wise. The candidates are required to sign in the register and pay the processing fee and proceed for verification of certificates. Candidates belonging to SC / ST category have to pay Rs. 450/- and all others have to pay Rs.900/– towards processing fee which is non-refundable. 3. The candidates belongs to BC/SC/ST Categories are required to submit integrated Community certificate duly signed by Mandal Revenue Officer [MRO]. 4. Tuition fee reimbursement will be as per the rules of respective state governments of Andhra Pradesh and Telangana. Income certificate issued by MRO after 01-01-2015 house hold card (white) will be considered. 5. The candidates shall produce Original certificates as notified at the time of certificate verification and bring Xerox copies of certificates for submission. 6. Every candidate shall furnish a mobile number at the time of Verification. One Time Password will be communicated to this mobile number. Request for change of mobile number will not be entertained under any circumstances. 7. The verification officer will verify the genuinity of the certificates produced and collect the Xerox copies of certificates. 8. Candidates qualified in more than one AP PGECET examination are required to attend for verification only once and inform the verification officer about the Hall Ticket Numbers of other examinations. 9. After verification, the candidate shall collect the Receipt of Certificates from the counter. 10. Candidates need to verify the mobile number, caste category, local area, gender, minority, parental income, special category, date of birth, eligible degree, specialization and details of other PGECET examinations printed on receipt of certificates. Any discrepancy should be brought to the notice of Camp Officer / Co-ordinator immediately for corrections. Seat allotment process depends on the accuracy of the above data. You are also jointly responsible for ensuring the correctness of the data. 11. Candidate can give options on the web either from helpline centre / home / any other place having internet facility. One Time Password will be sent to the registered mobile number. The password consists of SIX letter code with English capitals A to Z. 12. The detailed instructions for entering options on web are available at http://appgecet.apsche.ac.in or http://appgecet.org. 13. On the notified date, the web options are processed and allotment is communicated to the candidate through SMS. 14. Candidate can download the provisional allotment order, and report at the concerned college. 15. While exercising options all the eligible colleges and courses are displayed for selection based on the GATE/ GPAT/ APPGECET examinations written, qualifying degree and specialization. The candidates who have written more than one examination need to exercise options on any of the Hall Ticket Numbers. 16. Candidates are instructed to be careful while exercising options on the web and take the print out of the Saved options. 17. For latest updates, visit the website http://appgecet.apsche.ac.in. 18. Refer Annexure-I for instructions to the candidates for exercising options on web. 19. Candidates are informed to check their final allotment, take printout of allotment letter from the web, and report to the respective colleges on or before the date furnished on the allotment letter, failing which the candidate will lose the admission. 20. If candidate desires to cancel his / her admission and again want to appear in next round of counselling, has to pay processing fee again as a fresh candidate. 21.If a candidate wishes to withdraw from counselling, he / she can do so by submitting an application to that effect to the co-ordinator, helpline center along with receipt of certificates. 22.Next round of counselling for left over seats in phase-I and not reported cases and new seats sanctioned, if any, will be conducted. 23. A separate notification will be issued for Phase-II, for the left over seats and new seats, if any, sanctioned. 24. Who should participate in Phase-II? a. Who secure a seat in earlier phase of web based counselling and wish to move to some other college. b. Candidates who participated in earlier phase of web based counselling and could not secure a seat. c. Candidates who did not participate in earlier phase even though he / she has been called for counseling. d. Candidates who were allotted a seat but didn’t report. e. A candidate allotted a seat in earlier phase but cancelled his / her admission. a. Options Exercised for one phase will not be considered for other phase of counselling. b. Candidates have to exercise options afresh for each phase of web based counselling. c. In case if they are satisfied with the previous allotment, options need not be exercised again. d. Options may be exercised for those colleges even if the vacancies are not available, as vacancies may arise due to sliding, cancellation and conversions. 26. If the candidate secures a seat in phase – II, he / she will lose the claim on the earlier allotted college, and has to report to the new college by downloading the allotment letter on or before the date furnished in the allotment letter. Failing to report within the date furnished in the allotted college, the candidate will forfeit the claim on the new college as well as on the old college. 27. If the candidate is not interested to join in allotted college, he / she may request for cancellation of allotted seat at the helpline center before the date specified. 28. Before a cut off date, the candidate can cancel the allotted seat, by getting endorsement on request letter from the Principal of the college. 29.After the cut-off date for admission, in case the candidates wish to cancel their admission, they are required to approach the principal of the college concerned only. 30. The left over seats after allotment for GATE / GPAT Candidates are alone available for PGECET candidates. Candidates are advised to visit the website http://appgecet.apsche.ac.in for vacancies before attending certificate verification.